AT&T | My Name Is Benwizzi, I Am A Tech Nerd. No iPhone 5?! No Problem! iPhone 4S Sales Launch Went Through The Roof!! I am back and actually wrote this last Friday. Let me start off by saying that I’ve been working hard on getting our new blog setup and running. I am hoping that our reader base will love the new look and feel we will bring to you. I am taking my time to make sure it works 150% the way I want it to on the frontend(design) but primarily on the backend which can be frustrating. Now back to the topic of the title. You might already know this if you bought the iPhone 4S already or read tech news, the iPhone 4S is selling like it’s gold or better than gold even. 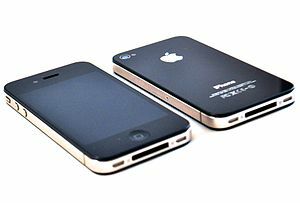 If you didn’t read my post “iPhone 4S Is Not So Bad And It Fits The Apple Strategy. Let Me Tell You Why.“, you should before this one. Anyway, my insight on that blog post was on point. Apple was never honestly never worried about the iPhone 4S selling potential. The proof is the pudding people. They know their product’s market appeal and know how to present it to its consumer base. Numbers numbers numbers… Apple reported on October 10th that their pre-order sales of their iPhone 4s shattered their previous record of single day record of 600,000 units. We’re talking about 1,000,000 pre-order sales in a 24 hour period! 1,000,000 people!! iPhone 5 who?! Apple’s stock market price dipped when they didn’t announce their much-anticipated iPhone 5. You think Apple cared? Obviously not. I know a few people who already have the iPhone 4S in their hands, even before the official launch of today or maybe they lied. Sprint‘s launch of both the iPhone 4S and iPhone 4 is proving to be their best sales day overall ever. Don’t take my word for it. Fared Adib, Sprint Product Chief released this statement. AT&T is reporting that, as of 4:40pm EST time, are on pace to double their single day activation record. Seriously, I saw this coming but not like this. By last Friday, they had already reached more than 200,000 pre-orders in only 12 hours. I haven’t seen any specific information from Verizon as they take their time to report on numbers. However, I have read somewhere that sales of their iPhone 4S are “moving swiftly”. Some also speculate that the passing of Steve Jobs, sadly, can be considered as a boost to these crazy numbers. All I got say, Apple knows what the hell they’re doing. The business model and mentality that Steve Jobs instilled in Apple will hopefully live on for a long time to come! iPhone 4S Is Not So Bad And It Fits The Apple Strategy. Let Me Tell You Why. Alright people! It feels like the sky is falling and pigs started to fly. Yes everybody was waiting eagerly for the iPhone 5 but now have to settle for the meager upgrade of the iPhone 4S. Apple never actually confirmed or commented on all the rumors and hype of the iPhone 5 so honestly you can’t be mad at them. I did have an inkling that they would only release the iPhone 4S but didn’t want to keep reporting on rumors and decided to wait on the news from the horse’s mouth, Apple. Now let me take a look at the pros and cons of this iPhone release. Apple will starting taking pre-orders for the iPhone 4S on October 7th and will be released on the 14th of the month. It will come in 2 colors flavors, black & white, and 3 price points; a 16GB version for $199, a 32GB version for $299 and a 64GB for $399. No surprise here as they always release different versions based on internal drive space. I still don’t understand why they don’t use micro SD technology instead handcuffing consumers to a specific memory. I do have a Nexus S 4G with only internal memory of 16GB only because I had gotten used to 8GB and welcomed the added memory. However, it’s never enough! Now the good part is that the older models prices go down opening the door to new Apple customers. The iPhone 3GS will come down to $0.00 with a contract of course and the iPhone 4 to $99. None of this impressed Wall Street as their stock prices dipped 5% after this news. The iPhone 4S will be launching with the 2 usual suspects in Verizon Wireless and AT&T but they will be adding the third largest carrier in the U.S. with Sprint. the iPhone 3GS will stay on AT&T only but Sprint will get the iPhone 4S and possibly the iPhone 4. Sprint actually closed a $20 billion deal with Apple to buy 30.5 million iPhones and don’t believe they’ll profit on the deal till 2014. I really don’t know what to think about this one. It’s a big gamble but I feel Sprint. It’s not fun being in 3rd place on the market. It’s a big win for Apple to reach more consumers and that is their bottom line! T-Mobile is still left out of this iPhone craze. Hmmmm…I let you guys mull over that one! They’ve also increased their reach with carriers globally. Now this is a big part of this release that is a gamble for iPhone. While Android (and even others like Windows 7) manufacturers are pushing the limit with their hardware, Apple seems content with minor upgrade to merely catch up to the competition. There’s 2 charts here showing the difference between the iPhone 4S, its brethren and the competition. Click images to enlarge. From what I can see they did improve the video recording to 1080p, improve the camera to 8mp with face detection and 5-element lens (whatever that means). Nothing crazy really. Now, along with the iOS 5 update, Siri, a talking personal assistant , is the “biggest” innovation from this release. I say biggest in quotation only because I believe this technology is a natural progression of what’s now offered on the market with voice detection. Google is said to be working on a similar technology with their next Android OS update with Ice Cream Sandwich. I will let you study the competition and see for yourself why people are disappointed in this release as far as specs go. I will say this though: the missing 4G is big!! Most smartphone manufacturers have been on the 4G tip since summer 2010(.e. HTC EVO 4G). While I do understand that 4G does kill your battery and the battery is terrible, I still believe they should have included that feature on this phone. All in all, the iPhone 4S fits right into Apple’s business strategy. They have opened more options for US customers to get their products and have also added new price points for their different device models. Costumers that are up on their contract with their iPhone 3GS can now upgrade to the iPhone 4S. New customers that can’t afford their latest model can opt for the more cost-effective models on the market. It’s a win win for Apple. For the consumers, it leaves a bit to be desired. Apple will still be stacking that mountain of cash flow. No problem! What do you think? Good News For T-Mobile Customers and Mobile Wireless Consumers Alike! Unless you’ve been too caught up in your world, you have probably heard of the proposed merger between AT&T & T-Mobile USA, the U.S.-based subsidiary of Deutsche Telekom AG, back in March. AT&T would acquire T-Mobile for $39 billion and we would be left with 3 major carriers with Sprint being a very distant 3rd place. There have been arguments from both sides of the fence but speaking from a consumer’s perspective, if the merger goes through would be detrimental for us, the consumers!